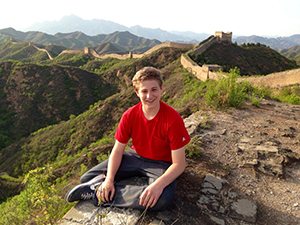 Newhouse School sophomore Chase Guttman has been named 2015 Young Travel Photographer of the Year (TPOTY) in an international competition judged by museum curators and magazine editors. This is one of series of accolades for Guttman, a photography major. He was named a Best Travel Photography Blogger by USA Today, a Top Travel Photographer by the New York Institute of Photography and a Rising Star by Instagram. He first earned TPOTY honors in 2012 in the 14 and under age group, and again in 2012 when he won the Emerging Talent award. He has traveled to every U.S. state and over 50 countries. For a look at Guttman’s portfolio, and the portfolios of other 2015 TPOTY honorees, see http://www.tpoty.com/winners/2015. Winning images will be exhibited at the Museum of London Docklands in Summer 2016.